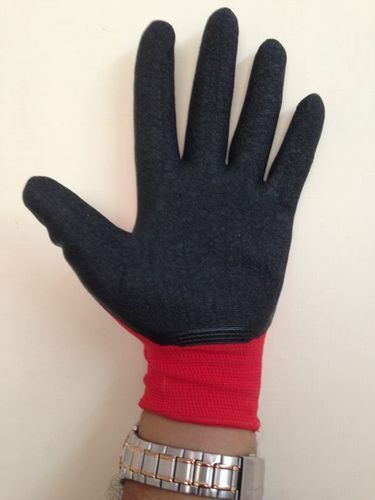 We are the leading manufacturer and Exporter of Latex Coated Gloves and our product is made of good quality. “Balaji Industries” is a leading and well established name in the field of manufacturing, supplying, distributing and trading of fire, welding & chemical safety products, industrial safety products, surgical gloves and other disposable safety products. Backed by more than four decade of industry expertise, the company is running its business operations from Mumbai, Maharashtra, India under the visionary guidance of Mrs. Girija Sidram Narayankar. With the products offered including fire suits, ear defenders, hand gloves, safety shoes, safety face shield, full face mask, full body safety belts and others, these are manufactured using superior grade raw material as per defined industry guidelines. Further, these products also provide for perfect fit and provide for maximum protection to the users. Being widely demanded by quality conscious clients, some of the reputed customers “Balaji Industries” is currently serving include ONGC, Mazgoan Dock and others.